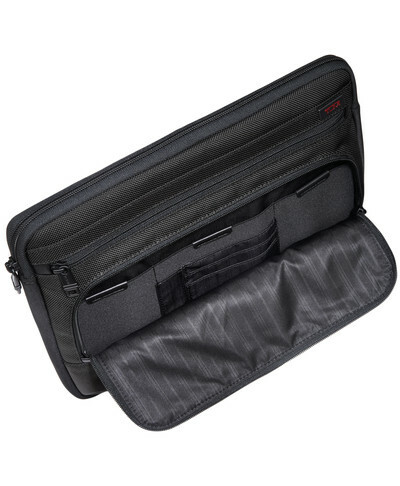 The Tumi Alpha Medium Laptop cover is a nylon case that fits laptops up to 13-inches. I had been looking to stream-line my business travel by eliminating both the need to tote around both a piece of carry-on luggage as well as my laptop bag. Less is more when trying to get around the airport quickly. Before getting the Tumi, I had tried the Incase Neoprene Pro Sleeve for the 13-inch MacBook Air, as it had a side compartment with a zipper – it went back to the Apple Store. It wasn’t professional looking enough and there was not enough storage space. The Tumi cover had a more rugged Nylon cover, a zipper side compartment and a second, outer zippered side compartment for pens, business cards, access badges (and the like). The cover is perfect, I can fit video adapter cables in the side pockets, my wireless mouse, pens, access badges and a small notebook with the Tumi keeping its slender figure. I can carry it around, and look good doing it. With the MacBook Air mid-2013 model, I don’t need to carry around the charging adapter, which helps quite a bit. Unless you use a laptop will either great battery life, or with a relatively small or slender charging unit, it might be a stretch to fit what you need for power and charging in this case – it may fit, but it will bulge. There is no strap for this unit, but you don’t need one – that defeats the purpose and style of the cover. This cover comes in small and large sizes too, where a small would fit an 11-inch MacBook Air perfectly, and the large size fits a 15-inch laptop. My MacBook Air fits snugly, almost perfectly, into the cover – not too much left over space, and just enough left over so I am never struggling to close it. Again, perfect fit. On an airplane, this cover can fit in the seat pocket if you want to get it out-of-the-way, and your laptop stays protected. And, having it nearby means you get easy access to your pen (for filling-out those cross-border forms), ear-phones (they tuck away nicely) or business cards (to give to the new contact you made on that 5 hour flight to San Francisco). My usual routine is to pull it out of my carry-on luggage sleeve, just before I throw the carry-on in the overhead compartment. Simple, and no fiddling. The Tumi is expensive and the brand carries a premium – the price is around $100 which is more than double almost any other laptop cover you can find out there. However, I think it is worth the price. The bottom line: The best slim laptop cover and carrying case I could find on the market, it’s worth the price and has enough pockets to fit a good number of smaller items you might want to carry around, beware if your laptop has poor battery life and you need to carry a bulky charger.